USDA Loan Limits: How Much Can You Borrow? Nearly all loan programs in the country have limitations on how much you can borrow. At the time of publishing this article the loan limit for Conventional loans throughout the country is $484,350 and FHA is $294,515. These loan limits apply to single family homes but can be higher for multi-family and homes located in designated high cost counties. Loan limits often force a borrower’s hand to go with a certain loan program that meets their desired financing amount. For example, borrowers looking for a more expensive home - $600,000 for example –don’t have many options and are forced to consider a Jumbo loan as standard FHA and Conventional financing are not options. However, one of the many benefits to the Rural Housing Loan, is that it DOES NOT have a loan limit. There are two separate USDA Loan programs: direct and guaranteed and each have different rules and requirements. The USDA Direct Loan does have set loan limits in place, while the USDA Guaranteed Loan does not. The USDA Guaranteed Loan is a USDA-backed mortgage where the money is lent by USDA-approved private lending institutions (banks, mortgage companies, etc.). Once the loan is closed then the loan is insured by the USDA. The USDA Guaranteed Loan is the most common Rural Housing Loan and the easier one to qualify for. In our Rural Housing Loan article, we highlight a lot of the benefits and what it takes to qualify. 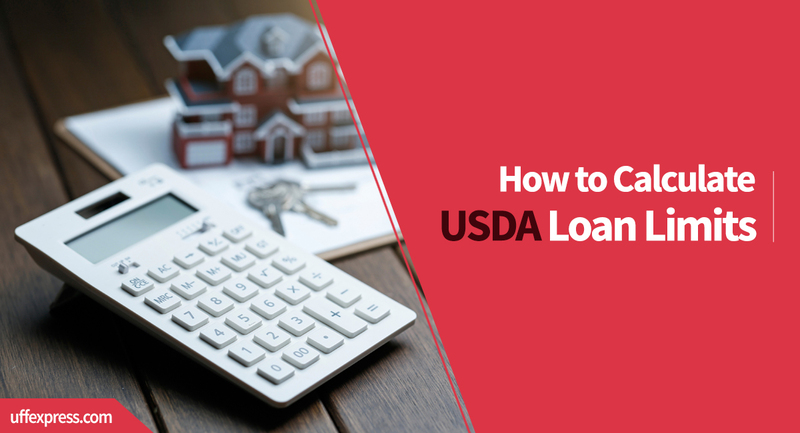 Even though the USDA Guaranteed Loan has no limit on the amount you can borrow, it’s highly unlikely any borrower could get a USDA Loan for more than $300,000-$400,000. Since the USDA loan is geared towards low-to-moderate income families, they have strict income limits. Because of these income limits and rules around debt-to-income ratios (the percentage your mortgage payment can be of your gross monthly income), these rules ultimately limit how much a borrower can qualify for. The USDA caps the mortgage payment at 29% of the qualifying income on the loan. In some instances, the USDA will allow a 32% housing expense ratio, but that is only if the borrowers credit exceeds 680 and they have compensating factors. So how can you calculate what loan limit you could qualify for? Using our USDA Loan Calculator, you can get a good idea of what a projected mortgage payment would run. Example: if you have $3,000 in gross monthly income, then 29% of that figure (the maximum house payment you could qualify for) is $870/month. So, your total mortgage payment would have to be $870 or less. Using the payment calculator, you can run various scenarios and really get a good idea of how much home (in terms of purchase price) you could qualify for and really get a good idea of the loan limit that would be allowed in your scenario. When you're ready to see how much you can borrow, you can apply for a USDA Loan Online in a matter of minutes. USDA Direct loans are specifically for families with low income. Unlikely the Guaranteed Loan, the USDA directly lends the money for these mortgages and private lenders are not included in the process. The Direct loan program is like the Guaranteed Loan in that the property still has to be in eligible locations, there are strict income guidelines as well as debt-to-income ratios. The USDA Direct Loan is a much less common option but still a great home loan for those that can qualify. For this program, the USDA does have strict caps on loan limits. For a full breakdown of the USDA Direct Loan Limits visit https://www.rd.usda.gov/files/RD-SFHAreaLoanLimitMap.pdf.